Wyndham Garden Hotel Polanco Mexico City, Hotel Mexico. Limited Time Offer! Wyndham Garden Mexico City Polanco. The 4-star hotel "Wyndham Garden Mexico City Polanco" is a perfect place to stay when exploring Mexico. 81 rooms are featured. The air conditioning keeps the heat outside, always ensuring a comfortable temperature. The bedrooms overlook a patio. Start your day enjoying nature in the private inner courtyard and garden. The residence boasts a gymnasium where you have the opportunity to exercise. Dinner can be served at the gastronomic onsite restaurant. For a drink after dinner, visitors will find the bar most welcoming. Business people will appreciate that there is Internet access available at no extra charge. 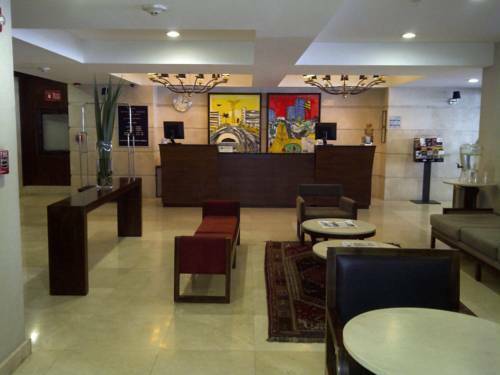 Situated in the heart of Mexico City, this conveniently placed hotel is directly connected to a large shopping center and features comfortable accommodations close to many cultural and business areas.